Image caption Arlene Foster said Sinn Féin were being "utterly careless" for their "decision to boycott the Assembly"
Politicians have largely welcomed Karen Bradley's announcement. The Northern Ireland Secretary said Stormont Assembly members' pay would be cut from £49,500 to £35,888. She also ruled out calling an election and is to bring forward legislation to allow civil servants to make decisions in the absence of devolution. "Faced with the prospect of a court-ordered election, Karen Bradley has now moved to suspend her powers to call an election as set out in the legislation. That is a retrograde step. "Any attempt to move away from the Good Friday Agreement or towards direct rule will fail. "Clearly, the British government's reliance on the DUP remains a central problem and if any process around restoring the institutions is to be credible, Karen Bradley must begin prioritising the rights of citizens over Tory Party self-interest. "The reduction in MLA pay should have been introduced months ago." "The proposal to reduce the pay for MLAs is a sensible step as we are not able to fulfil our full role as legislators. "We would prefer to have a fully functioning local Executive where decisions about our schools, roads and hospitals are being made in Northern Ireland. "Sinn Féin is the roadblock to an Executive. It is the only major party boycotting the Executive. All other parties would elect ministers today without preconditions. "We stand ready to form an Executive today and enter an Assembly with nothing but our mandate." "For months the Ulster Unionist Party has been urging the secretary of state to take action. "However, this looks like another holding statement from Karen Bradley. "It's only a sticking plaster on a huge political mess in which Northern Ireland finds itself, and the blame for that lies squarely with Sinn Féin and the DUP. "What we need is a fully functioning Assembly and Executive where locally elected MLAs can hold local ministers to account and get to grips with the crisis in the health service, in education and take the whole range of decisions that have been put 'on ice' in the absence of executive ministers." "We welcome the proposed legislation to allow government departments to make more decisions and we hope that the big infrastructure projects can now move forward. "In our New Deal for Northern Ireland that we launched at parliament, we called for rapid decisions to be made to support our economy in these challenging times." "The public anger at the political drift here is growing, so if the secretary of state is confident that what she has outlined will be the catalyst to get things moving again, particularly with respect to key decisions that are required, then that is to be welcomed. "It was also clear on Monday when, in the absence of any kind of leadership from the SOS and her team, representatives of all parties responded to my invite to get around the table and begin the process of finding lasting solutions to the many issues that still divide us, that there was a clear need for the two governments to live up to their respective responsibilities." "This political vacuum that we have found ourselves in has already gone on for far too long. "The truth remains, without a functioning Assembly, MLAs are not fulfilling the full job that they were elected to do. "The SDLP has been clear time and time again, we are ready and willing to engage. We did not create this political vacuum and we have absolutely no desire to remain in it." "I thought today was going to be the day she would do something for us. "Left us out and didn't even mention us. I'm nearly in tears. "At last the secretary of state is moving to cut MLA salaries. Good - about time. "However, by continuing to duck her responsibility to govern, by planning to legitimise decision-making by civil servants, demonstrates, again, a lack of mettle. "It is the appointment of ministers accountable to parliament that is required, not the poor substitute of empowering unelected civil servants." "NI Chamber has been asking the secretary of state to put in place special legislative measures to allow civil servants to take important decisions for some time now. "Therefore the announcement is warmly welcomed and should allow civil servants to proceed with vital decisions which are to the benefit of everyone in Northern Ireland." "This is a political impasse that the two main parties appear content to stay stuck in and I don't think a reduction in MLAs salary will push those parties closer to an agreement. "However, I hope it will satisfy the nurses, teachers, drivers and all hard working people across Northern Ireland who have expressed understandable anger at a lack of political progress from full salaried MLAs." 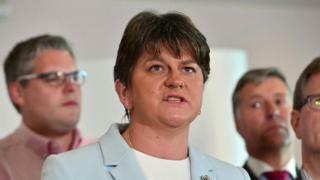 "The announcement further underlines the seriousness of the absence of the devolved institutions in Northern Ireland, and the urgent requirement for all with responsibilities to do everything in their power to get them operating again. "I will be engaging further with the secretary of state for Northern Ireland on how both Governments can most effectively support that urgent work in the period immediately ahead."